A record 114.4 million people watched the New England Patriots defeat the Seattle Seahawks in the Super Bowl on Sunday, the largest audience for a U.S. television program in history, according to preliminary figures from Nielsen. NBC’s telecast of Super Bowl XLIX, a nail-biter that the Patriots won 28-24 on a last-minute interception, topped the old record of 112.2 million set last year by Fox’s coverage of the Seahawks easy victory over the Denver Broncos. This was the seventh straight Super Bowl that drew over 100 million viewers and the fourth in five years to set a new viewing record. Advertisers shelled out as much as $4.5 million for a 30-second spot in the game, also a record. Comcast Corp. ’s NBC benefited from the tight game that was tied at halftime and literally went down to the final seconds. In the last 10 minutes of the fourth quarter, there were over 120 million viewers watching. GREAT PLAY: A record 114.4 million people watched New England defeat Seattle Sunday, the largest audience ever for a U.S. television program. Advertisers shelled out as much as $4.5 million for a spot. The halftime show, which featured Katy Perry, Missy Elliot and Lenny Kravitz, also set a viewing record, with 118.5 million viewers tuning in. That was an increase of more than three million viewers from last year’s performance by Bruno Mars and the Red Hot Chili Peppers. NBC also streamed the game live, at no charge, and said it had 1.3 million users on computers and tablets. After the game, NBC aired a special episode of its drama “The Blacklist,” which was seen by 26.5 million people. Deciding what to air after a Super Bowl is always a challenge for the network that has the big game. For many years, the prevailing wisdom was that premiering a new show in the post-Super Bowl slot made the most sense because it was such a huge launchpad. 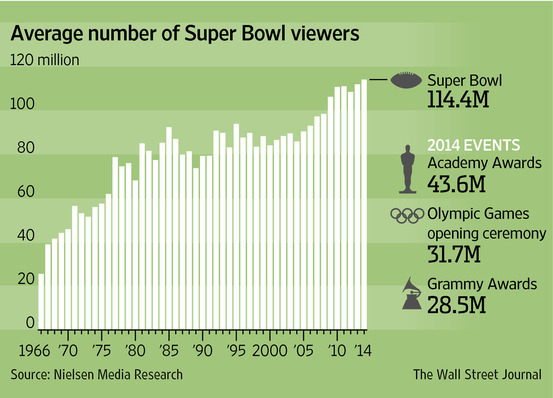 NBC’s “The A-Team” and ABC’s “The Wonder Years” both benefited from premiering after the Super Bowl. But there also have been many flops, such as “The Good Life” by NBC in 1994. Networks now typically play it safer by airing a special episode of an existing show in the hopes of getting it sampled by a wider audience. While “The Blacklist” is already a hit, the network is moving it from Monday to Thursday starting this week and the special Super Bowl episode will help promote that relocation. The last network to try a new show after the Super Bowl was CBS Corp. ’s namesake network in 2010, with “Undercover Boss,” which went on to become a success. NBC’s big numbers will likely ensure that CBS, which has the rights to next year’s Super Bowl, will be able to charge even more for a 30-second commercial. Already industry insiders are speculating that the price tag could hit $5 million per-spot.